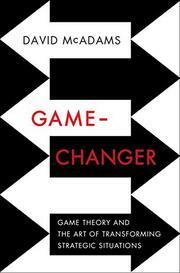 Over the past 40 years, the author writes, game theory has become “a mainstay” in economics, political science, business strategy and the military, among other areas. Developing what he calls “game awareness,” he generalizes a method of plotting tactics and provides actionable insights in order to improve the understanding and predictive capabilities that can enrich the lives of families and individuals. Out of many possible games, McAdams returns most frequently to the classic “Prisoners' Dilemma.” Two partners in crime separately face the choice whether to confess or not. Confession, however, apparently the best choice for each, will be the worst for both. McAdams shows how to recognize life situations based on this dilemma to illustrate his principle that ruthless competition is not always the best strategy. He provides six methods to accomplish this and supplements them with another three ways to change the game completely. Each is intended to build an ethic of cooperation and trust. The author employs examples along the “gaming tree” and the “payoff matrix.” The gaming tree represents players' decisions as branching points and summarizes the sequence of options as choices play out. The matrix is an arrangement of rows and columns that organizes an overview of players and their possible moves; it permits ranking of outcomes and comparison of different games to identify their common features. McAdams also provides his “Game-Changer Files,” in which he discusses current real-life problems—e.g., online price competition and real estate agency—to highlight the way “game awareness” can be generalized to the benefit of individual freedom of choice. Real-life lessons presented in a readily accessible way for the benefit of nonbusiness readers.